So the 80th annual Oscar award ceremony — excuse me, “Oscar®” award — starts in about a half hour, and many weeks ago I planned on writing about my experiences watching the five contenders for the Best Picture nominee, and I suppose if I’m going to write something, I better do it quick. In addition to watching all the Best Picture nominees and writing about them, I had this whole plan about creating an image for the piece that was a collage of all the ticket stubs from the films. I saw the five nominees at four different cinemas, and I always save my ticket stubs, so I thought it might look kinda neat, plus adding a sense of verisimilitude to my “expertise” on the matter. I couldn’t find but two of the tickets, though, looking around the apartment for the last fifteen minutes. Found the stub from National Treasure: Book of Secrets, though! That’s a keepsake and no mistake! Sigh… Anyway, so in lieu of my original plan, I have simply stolen the above image from New York Magazine’s entertainment column, “The Vulture”, who provide me with daily snark and excellent coverage of all things spangly. I don’t watch the Oscars® anymore. I can’t recall when I stopped, precisely, I remember being outraged at an interview that Danny Elfman gave wherein he stated that he’d never win an Academy Award, because the snobs on the original soundtrack section of the Academy looked down upon his rock ‘n’ roll background and would never see him so nominated. (Although, now that his compositions no longer fill me with joy, I note that he’s listed as a member of the Academy on the official press release.) I remember watching the Oscars in early 1995 and loving Dave Letterman’s schtick, and bemoaning the fact that I didn’t record the “Do you want to buy a monkey?” montage. So I was confused when he recieved such bad press and aghast that Forrest Gump won some many accolades. Somewhere between the 1994 and 1998 Oscars, I gave up on the whole shebang, and instead started stumping for a system that ignored the word “best”, and instead concentrated upon a merit-based system of awards. If there was a good enough film to be worthy of recognition, it would be celebrated, but one wouldn’t choose between five just because millions and millions of dollars had been spent on three hundred-odd movies over the course of a calendar year, and they needed some spectacle to make it seem justifiable. It’s 7:03pm EST now, so I’ve run over my allotted time in which to generate some comment before the program starts. Suffice it to say that this is the first year in a considerable amount of time where I’ve felt like the nominations left me spoiled for choice, and all five films were of distinct voice and a high caliber of storytelling. Not all five deserve “Best” picture status, but I would be glad if any of them one. Yes, even if Jason Reitman, Skidmore College’s hottest dropout, vaults still further into a realm of success I couldn’t hope to grasp or even glimpse. Juno is too slight, and too immature in its storytelling to really stand next to the complexities of the other four, but I like the fact that it’s there. Anyway, it has been my assessment for some time that movies tend to win, not on their actual content, but on the psychic bulk of baggage that comes along with the film. Philadelphia wins for making people feel guilty, and Gump wins for making people feel good. Martin Scorcese wins because he’s been snubbed in the past, and actors win for previous parts that were amazing, but not sufficiently showy. On these criteria, therefore, I predict that the Coen Brothers will win for their unrecognized body of work, which shadows and hovers around Old Country with palpable force. None of the other films has sufficient behind-the-scenes personality to win for the best film, as Daniel Day Lewis is the only comparable presence in the running. But Daniel Day Lewis is no Paul Thomas Anderson, and while the producers may collect the Best Picture award, it always seems like they are a second — but more important — Best Director award. 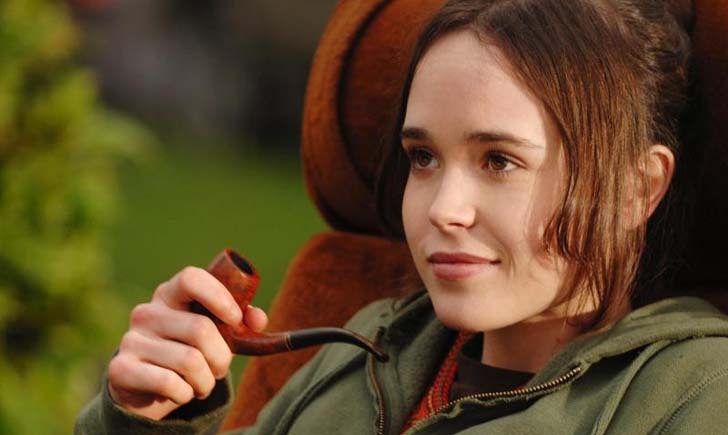 In closing, here’s a picture of Ellen Page not smoking a pipe. Let’s see that hit count shoot up now!